The incredible turnout at the job fair comes on the heels of the state labor commissioner's announcement that Georgia's jobless rate rose. 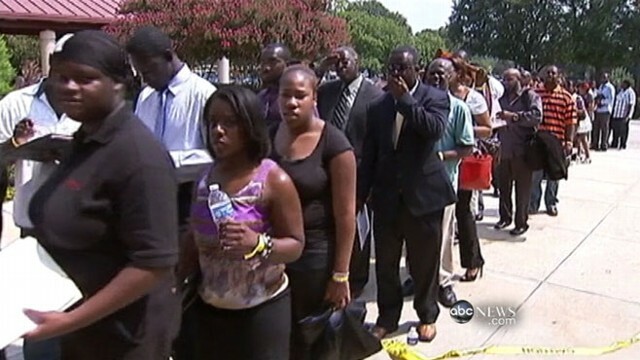 The line was full of hopefuls who waited for hours in a line that wrapped around the Atlanta Technical College where the event was held. The For the People Jobs Initiative, hosted by U.S. Reps. John Lewis and Hank Johnson and sponsored by the Congressional Black Caucus, is a series of job fairs and town halls at some of the urban areas hit hardest by unemployment and the financial crisis. The enormous turnout in Georgia created miles of traffic that clogged southwest Atlanta. "My feet are really killing me, and this line is really long," said job applicant Daisy Kennard. "But I'm willing to stay in this line no matter what," Kennard said. Like Kennard, thousands of others showed up for an opportunity to meet the 90 employers who attended. the event and eager to jumpstart their job search. The fair provided job seminars such as resume writing and mortgage modification workshops. The immense crowd at the two-day fair is another unneeded reminder of the dire state of the American economy. "I believe the recent lack of leadership in Washington is a contributing factor to the overall lack of confidence in the economy," said Mark Butler, Georgia's labor commissioner. "Due to this lack of confidence, we are seeing a business community that is hesitant to make further investments in this economy." The general inefficiency in Washington is precisely the reason why the Congressional Black Caucus launched the fair, said Mahen Gunaratna, a representative for Florida congresswoman Frederica Wilson, who will host Miami's Job Initiative fair. "The Congressional Black Caucus decided to take matters into their own hands," said Gunaratna. "They are tired of Republicans' inaction that prevents bills from moving forward. This is a real tangible opportunity for our constituents." And the people in the lines have not yet given up despite the relentless weather, miles of traffic and lines and months of unemployment. "You got child, you got kids, you got bills," said Derric Clayton, a former security guard with three children. He's been looking for work since May. "You've got to stay somewhere. You don't want to be homeless." Two more For the People Jobs Initiative fairs are set to take place in Miami and Los Angeles later this month. "You have to give people a sense of hope, a sense of optimism," said Lewis, a host of the Atlanta fair. "Tell them over and over again, 'Don't give up.'"